Alex Cunningham has added his backing to calls for better testing for heart valve disease to be incorporated into routine health checks for the over-60s, acknowledging that too few people recognise key symptoms when they arise and that not enough people receive a heart check-up when they visit their GP. 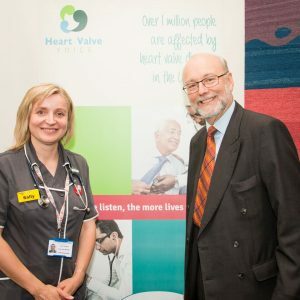 The Stockton North MP recently learned of significant under-diagnosis and incorrect referrals due to lack of education and awareness about heart valve disease, and was happy to support the campaign by Heart Valve Voice for improved access to stethoscope checks and echo-cardiogram tests for heart valve disease at a recent awareness event in Parliament. A recent survey revealed 94 per cent of over-60s in the UK are unfamiliar with aortic stenosis. At the same time, 72 per cent reported rarely, if ever, having their hearts listened to by a doctor. Yet annual mortality of severe aortic stenosis are considerably higher than most cancers, while heart valve disease affects approximately one million people over 65 years of age in the UK. The Labour MP was pleased to register his support for Heart Valve Voice’s campaign so that all suitable patients can be referred and have access to appropriate treatment at the right time, and to back the calls for a clearer pathway between primary, secondary and tertiary care to ensure more effective management of the disease across the UK. “It was fascinating to learn more about heart valve disease, which affects a high proportion of the UK population. But it was also very worrying to learn that there are such low levels of awareness and concern across the country, especially when early diagnosis is so important if treatment is to be effective.